The Mid City Ballroom can fit around 300 music fans for performances. Photos by Stephanie Landry. When James Fogle first entered the vacant, red brick 1940s-era building on Acadian Thruway, he knew this was the place. Fogle, a local musician and real estate agent, was searching for a larger space for his Baton Rouge Music Exchange, a vintage and used musical instrument shop. He first opened it on Perkins Road in 2015, but he soon realized the space the business occupied was much too small. 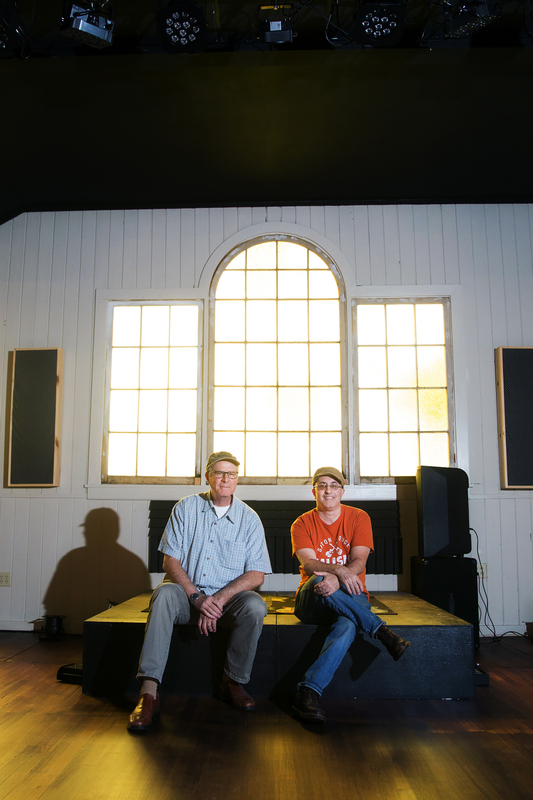 From left, Steve Levine and James Fogle renovated the former ministry building for a music venue and the new home of the Baton Rouge Music Exchange. The vacant church building on South Acadian, formerly occupied by the Mountain Faith Ministry, was the ideal space for an expanded Music Exchange. Fogle also saw enormous potential in the building’s former sanctuary. It could become the live music venue he’d dreamed of creating for years. During his first visit to the property, he excitedly sent 10 text messages to his business partner, attorney and musician Steve Levine. “I told Steve, ‘Come on; come on. Get over here now!’” Fogle recalls saying in the messages. The building wowed Levine, too. The offer he and Fogle made was accepted that same day. Levine renamed the sanctuary the Mid City Ballroom. On Aug. 11, following about a year of extensive renovations, the Mid City Ballroom hosted its first show with New Orleans roots-rock singer-guitarist Alvin Youngblood Hart and local favorite Chris LeBlanc. The following weekend, local all-stars played two 50th anniversary performances of the Beatles’ Sgt. Pepper’s Lonely Hearts Club Band album. Enthusiastic crowds welcomed both events. The Sgt. Pepper performances featured 13 musicians on stage, including a string and horn section and musicians playing multiple instruments. Local music veteran Mike Pinter is the venue’s sound engineer. “If this thing takes off, we have many more plans for the future,” Fogle says. Fogle’s and Levine’s renovations include the expanded stage in the former sanctuary, which has the capacity to host 300 patrons or 200 seated. They painted the interior walls, renovated bathrooms, did extensive electrical work, replaced the roof and removed gray office carpet, revealing the original oak floors. 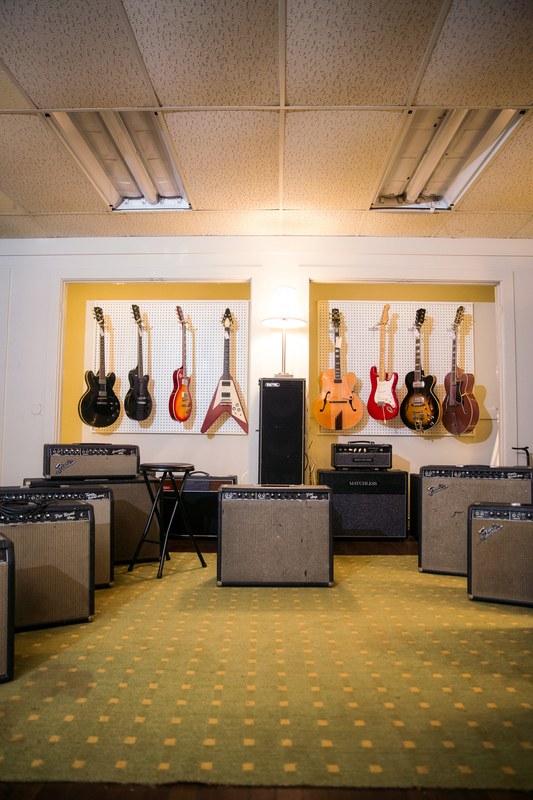 Vintage and used musical instruments are sold in the Baton Rouge Music Exchange space. The most dramatic renovation came with the removal of walls at the back of the stage. Now Mid City Ballroom patrons can see the large, yellow exterior windows behind it, with its central window arched in a typical church fashion. The parking lot is functional but still a work in progress. The proliferation of listening rooms in Baton Rouge, including the Red Dragon and Dyson House, inspired Fogle to take the plunge with the Mid City Ballroom. Fogle plans to present a variety of music, including jazz groups and midlevel touring acts. Private and public organizations may also book events in the space. The building also fulfills Fogle’s original intention for the space: It’s the new home for the Baton Rouge Music Exchange. In addition to selling and consigning instruments and equipment, the Music Exchange offers repairs and restorations. Accessories such as strings, drumheads and cables are also for sale. Mid City Ballroom is at 136 S. Acadian Thruway. Find them online at midcityballroom.com.